Letter from Dr. Yennie’s friend and Qi gong Master Wan Su-Jian on hearing of Dr. Yennie’s passing, October 11, 2013. “We deeply regret the un-timely passing away of my elder Brother Dr. Yennie and offer our deep condolences. My elder Brother was the messenger of friendship between China and America. The people of China and America have sustained a great loss by his death. Today, 18th of October is the mourning day of our center, Dr. Wan lead all of staff and students of him to lament the death of Dr. Yennie!!! We lower the flag to half-staff in the courtyard of our center!!! 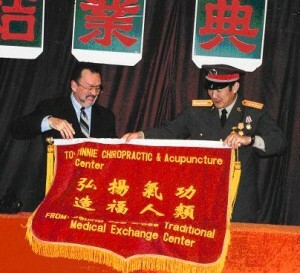 Thanks Dr. Yennie give a lot of contribution to doctors and patients in China and America! Now he return to the God and we pray for him!!! Master Wan has invited us to his Beijing Center, 2017 for a special tribute and celebration for his elder Brother Dr. Richard Yennie. Master Wan, as usual will host us in Beijing where we will also visit an acupuncture hospital, and various historical and modern sights. 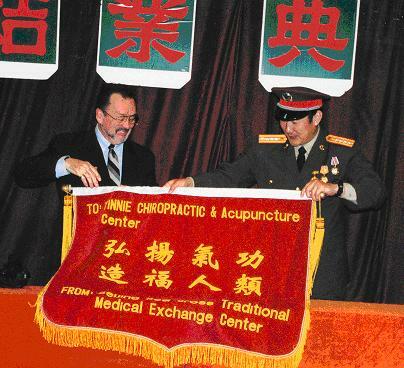 We will also travel to Chengdu visiting Chengdu University that includes an acupuncture college on campus. The sights in Chengdu and in the nearby vicinity are incredible. Acupuncture Society of America, Inc. Since ancient times, Chinese doctors focused on the prevention of disease. By instructing and guiding his patients, he taught them how to live a healthier and more productive lifestyle. His role was both doctor and teacher. This doctor-teacher approach is how we instruct our classes…we include acupuncture, the relationship between acupuncture and spinal adjusting (tu-ina), herbology/nutrition, and Qi gong…mind-body healing exercises. Classes are educational and informative with diagnostic and treatment methods easy to assimilate into an active practice. With the inclusion of acupuncture to your practice, your scope of treatable conditions is over 2,000. Be sure to contact us if you have any questions. We appreciate the opportunity to assist you with your acupuncture education and look forward to seeing you in class. Please invite your colleagues to attend. Register for the Basic 100, Advanced 200 or the Diplomate 300 online. ASA 100 hour course qualifies you to sit for the NBCE Exam. ASA 300 hour course qualifies you to sit for the ACA Council of Chiropractic Acupuncture Diplomate exam (DABCA). ASA courses meet requirements for Certification & CEUS in most States. Inquire about your state.